Legacy...according to the Webster Dictionary, the word Legacy means "a gift received from or passed down by an ancestor or predecessor from the past." A wealth of racing knowledge, a gift shall we say, has truly been passed down through the Allison's. Most noted for the "Alabama Gang", the Allison family has been a part of NASCAR and stock car racing since before the time multi-million dollar sponsors made their way into the sport. Back before auto racing reached its' mega-stardom of today, Donnie and Bobby Allison simply grew up with the sport, etching the Allison name into racing's history books in the process. The Allison name also has many race fans reflecting on the tragedies endured by the family over the years, as the names Davey and Clifford Allison remind us all of how things can change in the blink of an eye. In addition to racing, the Allison's are about family, and that remains their strength to carry on in a sport passed down through a generation. Today, the Allison family heritage is being carried on by brothers, Kenny, Ronald, and Donald, sons of the legendary Donnie Allison. The Allison brothers are experienced racers, who are best known presently in the sport, as premium race car builders. Though the brothers have built everything from Winston Cup to All Pro race cars, their most visible work in recent years has been seen through the tremendous growth of the Legends car series. At the beginning of 1996, following three years of research and development, the brothers introduced a car and series with a different set of criteria from the Legends. 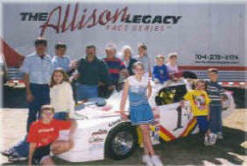 The Allison Legacy Race Car is the new car, built by a family of pure racers. With their introduction of the Allison Legacy Race Car, the brothers are carrying on the Allison family heritage in auto racing. In addition to the Allison brothers, Justin Allison continues the family tradition and is a third generation Allison driver. Pam Allison Stricklin, sister of Kenny, Ronald, and Donald, remains actively involved in the sport and is married to former NASCAR Cup driver Hut Stricklin. Stevie Allison, cousin to the Allison brothers, has made his mark in auto racing by competing in the Slim Jim All Pro Series. In 2009 Taylor Stricklin began his racing career in the Street Stock Division at Hickory Motor Speedway, won the 2014 Limited Late Model Championship and now drives a Super Late Model car at selected races. Donnie Allison remains actively involved in racing as a motorsports consultant. Donnie's wife Pat, a past Director of the Winston/Sprint Cup Racing Wives Auxiliary serves as Administrator for CompCar of NC, Inc., the sanctioning body of the Allison Legacy Race Series. Bobby Allison, a noted ambassador in auto racing, continues his involvement with NASCAR and the Cup Series. The Allison's have contributed a great deal to sport of auto racing. The entire family involvement in racing is now reflected in the Allison Legacy Race Series, and the family name is a recognized icon in motor sports. If the success the series boasted in the past few years is any indication for growth, the Allison brothers are definitely geared to be blazing into the future with their new Legacy Race Car. The gift passed down from Donnie and Bobby Allison, has truly been well received by the younger siblings, and is reflected in the Allison brothers' knowledge and quality workmanship. We've been around racing all our lives, it's part of who we are." 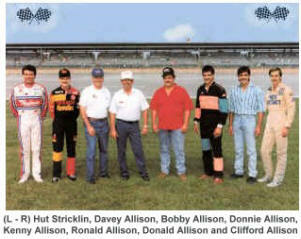 explains Kenny Allison, "My brothers and I, and our sister Pam, have always gone to the track with dad and mom. I've got kids of my own, and Donald has two children. We want to continue our family involvement in racing. Justin Allison, the 23 year old son of Kenny won the 2010 Allison Legacy Series Championship, has competed in PASS Super Late Model races and ran many of the tracks in the southeast. He made his debut in a sanctioned Legacy race at the road course at Carolina Motorsports Park in Kershaw, SC in December, 2005. He started on the pole and finished in the 10th position. Justin finished in eighth place in points in the Touring Series in 2006 with his grandfather, Donnie at the helm of the team and finished fourth in the Touring Series Points Chase in 2007, third in 2008 and 2009. He won the Pocono ARCA race in 2014 and had top finishes in that series in the 10 races that he drove. The young Allison girls work at the CompCar office and are actively involved with the goings on. Judging by the tight bond, and commitment to family, the Allison Legacy will be handed down from generation to generation long into the years ahead. In 1992 the company began building Legends Cars in conjunction with 600 Racing and continued through 1995. In 1995, the operation switched exclusively to the manufacturing of the new Allison Legacy Race Car. The shop is located approximately 45 minutes north of Charlotte near Salisbury, NC, on US 70. Visitors are welcome and shop tours are available upon request.2015 marks the 20th year the car has been in existence.